MON-FRI: 10:00 - 13:00 pm and by appointment. This practice is a dispensing practice. He has a special interest for pediatrics and sports medicine. He is currently married and has four children. His hobbies are mainly sports-related: he has a passion for skiing, cross-country running and cycling. Have been lucky to have Dr Waschnig as a family GP for a number of years. He definitely is the best GP in Cape Town City Bowl area. General short waiting periods, is a dispensing GP (so no additional trip to the Pharmacy), always helpful and friendly. Dr Waschnig is great - would recommend him to anyone considering a visit. No waiting - Professional service. Dr Waschnig is an excellent doctor. He is kind, has a lovely bedside manner and is thorough. The doctor was friendly and helped me with my illness, and I felt comfortable the whole time. Dr W has looked after me for about 10 years now. He is a wonderful doctor. Kind, non-judgmental and runs 2 practices but always makes time. Honest - takes his time - : -) listens to the patient, always friendly. Offers options. Excellent overall quality of service, child-friendly practice and most of all Dr Waschnig has a friendly, caring and professional manner with a very informative and helpful approach... Will definitely use him for any future GP visits for all my kids. Letzten Südafrika Urlaub waren wir bei Dr.Waschnig und waren sehr zufrieden. Er hat sich viel Zeit genommen und hat uns Kompetent beraten. Sehr sympathischer Arzt den wir auf alle Fälle weiterempfehlen! Was recommended to me ; very friendly and took his time and a lot of personal attention! Great doctor! Has taken care of my family for more than 15 years...this includes my mother, my daughters and myself. Perfect especially for German travellers. Thanks for the professional behaviour. Great Doctor. Gives personal attention as needed and does not rush the needed service. 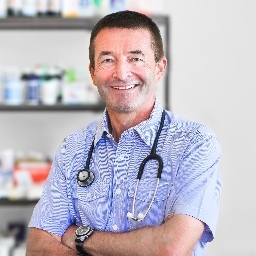 Dr. Wolfgang Waschnig is a very friendly and understanding doctor. He has been treating my family and me for several years now and we are all very satisfied with him. His practice is very central and easy to reach. Thanks to him we're still a healthy family!